entries in this year’s competition. 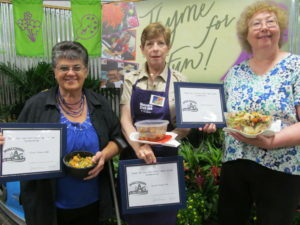 Beth Campbell, Belleville, won first place and $100 for her Kind of Corny Green Bean Salad. Elizabeth Thims of Waukesha placed second and earned $50 for her Chili Bean Salad. Bonnie Papala of Cudahy won third prize and $25 for her Bonnie’s Best Bean Salad. Farm Bureau’s Ag in the Classroom program provides teachers and students K-12 with an understanding of how their food is produced. The program seeks to work within existing curricula to provide basic information on our nation’s largest industry: agriculture.